Last weekend, we brought the kids out to the city to visit the Powerhouse Museum. On our way home, we stopped by at Mother Chu's Taiwanese Gourmet to grab some takeaway for dinner. We ordered some sweet and sour pork ribs with rice for the kids, amongst other things that we ordered for ourselves, namely spicy beef noodle soup, dough fritters and spring onion pancakes. When we arrived home, we discovered that they had given us rice with pig's trotter instead of pork ribs. Imagine our dismay! Well, we let the kids try the trotter dish anyway, and they seemed to love it, even asking for seconds! I decided to try a little and found it rather tasty to my surprise, given that its pale yellowish colour wasn't too aesthetically appealing. I was so used to eating pig's trotter cooked in black vinegar that this was a pleasant change for me. And since the kids loved it, I figured that I should try replicating this dish for our next meal. After searching the web for recipes on pig's trotters, and analysing many different versions, I finally settled on this one by Amy Beh. The trotters have a nice gelatinous texture that contributes to the sticky consistency of the gravy, coating your entire mouth with every spoonful. 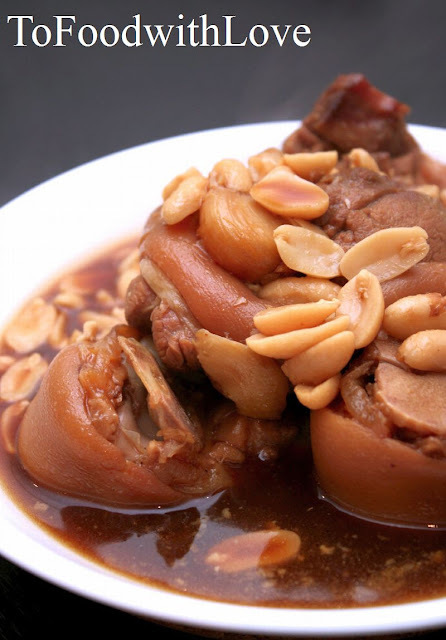 And the addition of braised peanuts gives this dish a nice mellow taste. Here is an adapted version of the recipe which is really easy to prepare. No knife and chopping board required! Cook peanuts in a pot of boiling water for 30 minutes. Drain and put aside. Rinse the trotter well, then blanch in boiling water for 5-6 minutes. Drain well. Rinse under a tap with cold water. Drain well. Combine trotters, peanuts, garlic, sauce ingredients and water in a deep pot. Bring to a boil, then cover and simmer for about 2 hours or until meat is tender and the gravy is thick. Add Shao Hsing wine. Serve immediately with steamed white rice.